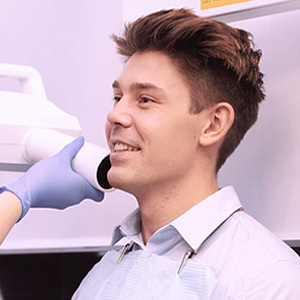 X-rays are such a routine part of dental care that it's easy to overlook how much this technology has revolutionized detecting and treating tooth decay. It's safe to say x-rays have helped save hundreds of millions of teeth over the last hundred years. Thanks to its unique properties these invisible electro-magnetic waves give us precise images of the interior structure of teeth and gums. It's so precise that we can clearly detect even a small spot of softened, decayed tooth structure on an exposed x-ray film, often before it becomes visible to the naked eye. As a result, we can begin treating the decay earlier, minimizing the damage and increasing the chances for preserving the tooth. There are a variety of ways we can utilize x-ray technology in diagnosing dental problems. The one, though, that's used the most is called the bitewing. The name comes from wing-like tabs extending out from a thin frame holding a segment of unexposed film. A technician places the frame inside the patient's mouth with the film on the tongue side of the teeth, and has them bite down on the tabs to hold the frame still. They then aim a camera at the patient's outer cheek, which then emits a very short burst of x-ray energy to expose the film. Bitewings are popular because they give a full view of the back and side teeth, where decay is often hard to detect, with very little radiation exposure to the patient. And as x-ray technology has progressed over the years with digital processing and more efficient equipment, we can acquire sharper images with even less exposure. We've also developed standard protocols for when and how often we perform x-rays, so that we're getting the most diagnostic benefit for the least amount of exposure time. Those few minutes getting an x-ray may seem routine, but the benefits to your dental health are truly amazing. The bitewing and other forms of x-rays play a huge role in helping us keep your teeth as healthy as they possibly can.